"...when the last individual of a race of living things breathes no more, another Heaven and another Earth must pass before such a one can be again." The Barbados Blackbelly is a hair sheep breed that evolved on the island of Barbados in the Caribbean. The breed descends from crosses of African hair sheep. and European wooled breeds that were brought to the island beginning in the mid-1600s. Barbados Blackbelly sheep thrive in the hot, humid environments that are challenging for most sheep but also do well in colder climates. Barbados Blackbelly reproduce non-seasonally, meaning that they breed and lamb year-round, and the ewes maintain pregnancies throughout the heat of the summer. The ewes are prolific, producing twins or triplets and can lamb twice a year under certain husbandry conditions. Barbados Blackbelly are excellent foragers, are highly resistant to disease, and can tolerate a higher worm load without requiring chemical intervention. The breed is reddish brown or tan on the body, with black on the belly and legs and black facial bars. Rams have a mane of thick hair that extends down the neck and brisket and may cover the shoulder. Ears point forward from the side without drooping. Sheep of both sexes are polled. The Barbados Blackbelly is a slow maturing breed and does not reach ideal weight until about 2 years of age. At that time, ewes weigh 85–100 pounds, and rams weigh 100–130 pounds. This relatively small body size has been favored by both natural and human selection in the Caribbean. Smaller sheep tolerate heat more easily, and the smaller carcasses are desirable from the farmers’ point of view, especially when refrigeration is lacking. The first documented importation of Barbados sheep into the United States occurred in 1904. The sheep attracted the most interest in Texas, where they were loosely managed, often crossed with Mouflon (a feral horned sheep) and Rambouillet to create a game animal with a large set of horns. By carefully selecting for horn growth, shedding ability, and color characteristics, this crossbreed was developed into a separate breed of sheep called the American Blackbelly. In the 1970s, Dr. Lemmuel Goode of North Carolina State University imported a small number of Barbados Blackbelly sheep directly from the island. Sheep from this importation have been the foundation for pure island-type Barbados Blackbelly sheep in the United States. As of 2010, there are fewer than 600 Barbados Blackbelly sheep in the continental U.S. A large research flock is owned by Virginia State University. The former North Carolina State University flock was sold in 1996 to a private breeder. In addition, recognizing the genetic crisis that was extinguishing the breed in the U.S., a handful of private breeders formed an informal cooperative to preserve the remaining genetics and reestablish the breed in the U.S.
Prospects for the Barbados breed in the United States are improving. The strong market for hair sheep, both here and in other countries, has encouraged those engaged in breed conservation. The Barbados Blackbelly Sheep Association International (BBSAI) reports that the number of annual Barbados Blackbelly registrations has risen from 82 in 2007 to 248 in 2010. The Barbados Blackbelly clearly deserves such attention. Its African origin (unusual in the Americas) and adaptation to tropical climates (unusual for sheep) gives the breed significant genetic value and production importance. 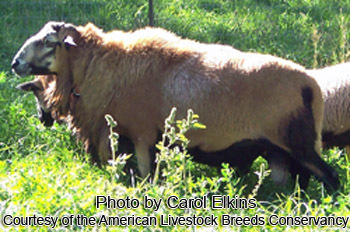 ALBC is a trademark of American Livestock Breeds Conservancy. Copyright © 1993-2009 American Livestock Breeds Conservancy.